Once again, husband and wife duo, Fatin & Aja give us an album chock full of quality songs, soulful modern instrumentation and the usual super vocals, lets get the negative out of the way – there are two tracks on here that are so removed from the rest of this album you can only shake your head in wonder at what they though they were doing. The rest however is soul music personified, straight then to the shuffling “Everybody’s hustling” so immediate, it’s like an old friend turning up after some time and catching up, you soon get into the groove, well you’ll be singing at the second play, destined for huge radio plays with its conscious lyrics and easy on the ear backing track, a monster all the way. The Philly sounding dancer “Never loved you more” with its Lou Rawls “See you when I git there” feel, this will blow up dance floors everywhere, this might even cross over to the handbag brigade, ripe for all manner of remixes. The other dancer on here is the simply stunning 70’s retro flavoured “All night lovin” the more adventurous jocks could drop this right in the middle of a crossover set, wonderful in every way. The title track is a ballad and what a way to showcase your voice, joined by only a piano, Aja takes the honours here, she has never sounded stronger, determined and so damn soulful. With the exception of the two nonsense tracks the rest of this album is spot on. With live show’s over here on the way it’s never been a better time to be a Kindred fan, I now have five albums by these guys sitting on the shelves, roll on number six. A beautiful woman with a voice to match and what an album she’s served up to us this time, kicking off with the Ann Peebles inspired “Love wont you try” with its Royal Studios sound, a chugging opus that should see some action in the more adventurous arena’s, “Call my name” is already getting strong radio plays, a down tempo modern day ballad without any theatre, just simple singing against a sympathetic backing, easy to see why the jocks have jumped on this, all very safe, but so good too. 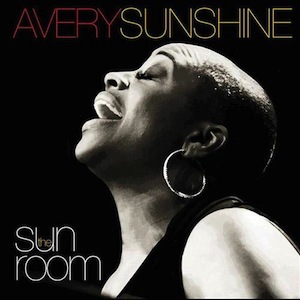 And so to my personal fave “I do love you”, a finger clicking base heavy stroller in a 60’s style that just builds and builds, her voice gets a good work out too as she tries to inject some feeling into the proceedings, a piano comes to the fore as we move through this gem, love it. “See you when I get there” is another finger snapper that will have you swaying and nodding your head, lovely tuneage. Buy it, stick it in the laser flicker, turn the volume up, and treat your neighbours to the sound of the summer 2014. Duet recordings in the jazz idiom are by no means a new phenomenon. One thinks immediately of piano-saxophone pairings such as Steve Lacy and Mal Waldron, or more recently of Joe Lovano and Hank Jones. However, piano-bass duets are somewhat thin on the ground, though not entirely unheard of and Haden himself has performed with the likes of Kenny Baron during the 1990s. The initial spark for the present collaboration came with a 2007 documentary on Haden’s career entitled, ‘Ramblin’ Boy’ on which Jarrett spoke about the bassist. This in turn led to informal playing between the pair and an eventual recording session at Keith Jarrett’s own home in March 2007. It is the music from those sessions that is contained within. 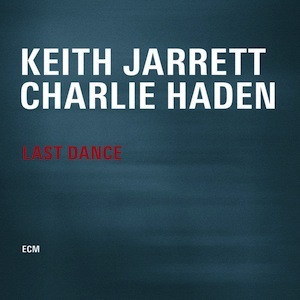 This album is a reunion of sorts since Charlie Haden was part of the earliest formation that Keith Jarrett led dating back to 1967. Furthermore, Haden participated on the 1975 ECM album ‘Arbour Zena’ that also featured Jan Garbarek. Haden returned the compliment when recording in 1976 his first set as a leader, ‘Closeness’ (A & M/Horizon), that featured Jarrett as one of the duo partners. Indeed there is a pertinent parallel between the two small ensemble careers of the musicians in that Haden has recorded with Quartet West while Jarrett has recorded extensively with his long-time trio. A classic selection of the Great American songbook and a few jazz standards are the fare here and the listener is immediately greeted by the solemnity of the opener, ‘My Old Flame’, while there is an interesting comparison to be made between the cover of Rodger and Hammerstein’s ‘It might as well be spring’ here with the Brad Mehldau trio version contained on the latter’s debut recording for Nonesuch. Whereas the Mehldau reworking is taken at a sprightly pace, Jarrett in contrast opts for an achingly slow interpretation, yet one that is nonetheless charged with human emotion. On Monk’s ‘Round Midnight’, the tempo is a tad more uplifting than might usually be attempted, though in the phrasing at least there are subtle shades of the composer/pianist in Jarrett’s interpretation. The latter states the main theme beautifully on Kurt Weill and Ira Gershwin’s ‘My Ship’ and he has never lost the ability to play prettily with rock solid accompaniment from Haden. Bop inflections permeate Bud Powell’s ‘Dance of the Infidels’. What comes across on these duets as a whole is the beautifully phrased stating of the theme as illustrated for example on ‘Every time we say goodbye’. Each piece has been carefully thought out by the duo and a different approach adopted accordingly. However, the duets never become formulaic since both musicians possess that key quality of being able to listener closely to one another and correspondingly play off one another. In general, the duets are surprisingly long in length with several over the nine minute mark, yet the test of genius is that the time flies by for the listener and that speaks volumes of the quality of music on display here. 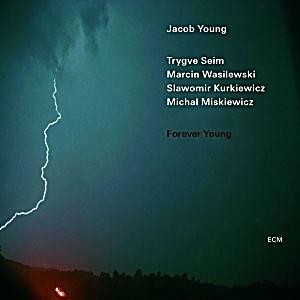 Norwegian guitarist Jacob Young, now in his mid-thirties, will be a new name to some, but has a dual US-Norwegian heritage in that his father is American and this is a wonderfully lyrical debut recording that promises a bright future for the young musician. Earning a scholarship to the New York School for Jazz and Contemporary Music in Manhattan, Young performed there under the tutorship of guitar great Jim Hall and it is the introspective nature of the latter’s approach that seems to have influenced Young’s more reflective approach alongside, perhaps, the early recordings of Pat Metheny. Friend and fellow Norwegian saxophone player Trygve Seim alternates between tenor and soprano to excellent effect and the tight rhythm section is made up of the Marcin Wasilewski trio, all three of whom are equally members of Manu Katche’s band which ensures a rock solid accompaniment throughout. 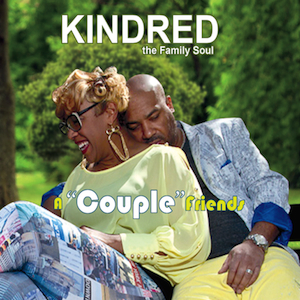 The emphasis is on gently uplifting numbers, all of which are group originals, and this is typified by ‘Bounce’ which recalls the old-school tenors of Coleman Hawkins and Ben Webster with beautifully melodic piano and a deeply soulful piece overall. Indeed, there is a impressive lyrical sensibility to the duet between guitarist and saxophonist softly sounding opener ‘I lost my heart to you’, and with delicate piano accompaniment from Wasilewski. Arguably the strongest number of all is the gorgeous ‘Sofia’s Dance’ with some gorgeous work from piano and soprano saxophone in unison and a main theme that is straight out of the Pat Metheny bag. Balladry is a particular strong point of Jacob Young’s work and acoustic ECM period Metheny is hinted at on ‘We were dancing’. 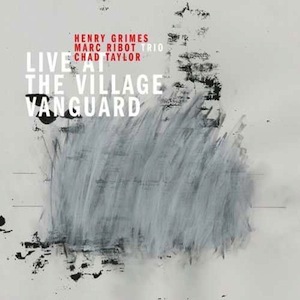 The biggest compliment one can pay to this well grounded ensemble is that the album as whole sounds like it has been recorded by seasoned musicians who have performed together over two or three decades and that augurs well for future recordings. As part of ECM’s CD re-issue programme which handily comes in slimline CD packaging, this original 1973 release is a welcome reminder of the long-term association that vibraphonist and leader Gary Burton has with the label and features members of the NDR Symphony Orchestra conduced by Mike Gibbs. In fact the album coincided with the very beginning of the collaboration with ECM since the first actual recording by Gary Burton’s ‘New Quartet’ was made in March 1973 and ‘Seven Songs for Quartet and Chamber Orchestra’ was recorded in December of that year. Both albums feature guitarist Michael Goodrick and the compositions and arranging skills of Mike Gibbs who is the author of all bar one of the numbers featured here. The orchestrations work best on compositions such as ‘Phases’ which, in its use of bass solo and ensemble work, hints at ‘Sketches of Spain’, though there is just an element of more avant-garde musings in Burton’s own space-like solo. An atmospheric Mahler-esque piece ‘Three’ is another highlight with strings and vibes combining well and the use of layered textures is repeated on the lengthy medley of an opener, ‘Nocturne Vulgaire/Arise, her eyes’.Of course these early albums pre-date the terrific ‘Dream so Real’ set from 1975 where Steve Swallow and Bob Moses formed part of the band as well as revealing a then relatively unknown Pat Metheny who would go on to great things and was a band member between 1974 and 1976. 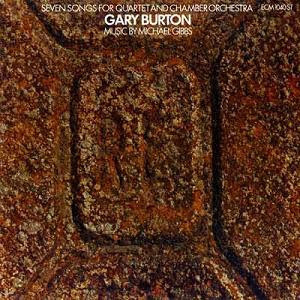 Nonetheless, this recording represents an interesting phase in Gary Burton’s career post-Atlantic and in so far as it exemplifies his chamber jazz period is far more introspective in overall approach. This new project is a summation of DJ Gilles Peterson’s devotion to and affection for Brazilian music and covers a whole gamut of musical styles from heavy percussive workouts to jazzy-tinged numbers and north-eastern Brazil roots flavours. Some top name musicians have been enlisted for the musical journey and they include percussionists Nana Vasconcelos, Armando Marçal (an integral member of Pat Metheny’s mid-late 1980s recordings that regularly featured Brazilian and, more generally, Latin American folk influences), Wilson das Neves with a bevvy of vocalists of the calibre of Seu Jorge, Elza Soares (a legendary samba singer who also just happened to be the wife of footballing great, Garrincha) and Marcos Valle among others, and the excellent Kassin (musical collaborator with Moreno Veloso, son of Caetano) taking care of keyboard duties. Some old chestnuts of Gilles Peterson’s personal Brazilian vinyl collection are revisited with the much loved Moacir Santos tune ‘Nanã’ receiving an Afro-Brazilian treatment with trombone and percussion to the fore and sounding as though it has been recorded in an echoey-sounding cave in the 1950s which adds a welcome touch of old-school atmosphere to proceedings. A typically light and delicate samba-funk piece from Marcos Valle and company on ‘Americas Latina’ is a stand out with its pan-Latino sentiment and another contribution from Valle ‘Estrelar’ conjurs up 1970s keyboards and a decidedly eery vocal sound. For an interesting left-field excursion, a radical reworking of the UK jazz-funk classic ‘Southern Freeez’ is slowed down somewhat from the original and transformed into a mid-tempo bossa breeze of a track with joint vocals courtesy of Valerie Etienne and Emanuelle Araújo. Another welcome surprise awaiting the listener is a reworking of a Francy Boland composition, ‘The Mystery of Man’, which here features some terrific string work interwoven into the whole. More traditional samba hues are showcased on both ‘Un Toque’ with lovely cavaquinho accompaniment and the rootsy ‘Brasil Pandeiro’, the pandeiro being the Brazilian equivalent of a tambourine and used as just one part of the instrumentation for a full-on escola de samba, or samba school. 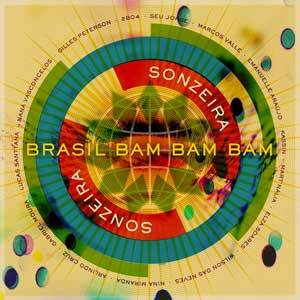 Here the accordion of the forró musical tradition has the samba percussion superimposed with female vocals. Garnering much airplay is the uptempo title track which is an intoxicating journey into samba territory that builds up a head of steam with repeated vamps. Only the re-interpretation of Airto Moreira’s classic ‘Xibaba’ is a tad tame in comparison to the manic original with its lengthy introduction and the omission of any number in tribute to George Duke’s ‘Brazilian Love Affair’ is a little surprising given Gilles P’s love of that recording. Otherwise, a fine effort to highlight the myriad genres that encompass música brasileira and there is even a subtle attempt at the unofficial Brazilian national anthem on ‘Aquarela do Brasil’ with vocals from Elza Soares. 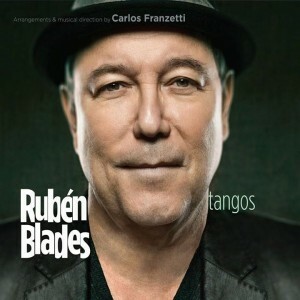 Panamanian singer Rubén Blades is something of a legend in the field of salsa and rightly so. He revolutionised the subject matter from fairly trite love songs to a far more engaging socio-political repertoire and did so while retaining a highly melodic rhythmic base which is the very essence of the salsa genre and burned up the dancefloors in the process. Blades worked his way up as a young low level employee for Fania records in New York, the typical trajectory for a Latin American emigrant. However, what he did next was anything buy ordinary. First, he developed his own idiosyncratic nasal-sounding voice and allied that to socially-committed lyrics that broke the mould with salsa writers. Secondly, he used the earnings raised with his success to then successfully apply for and complete a course in Law at Harvard. It is the high level of education attained that explains in part the quality of the lyrics and his ability to depict in song the everyday life as well as trials and tribulations of the Latin American emigrant that captured the hearts and minds of both the traditional salsa audience and well beyond. In each of three decades, Rubén Blades recorded definitive albums in the salsa idiom and they include: ‘Siembra’ (1978), ‘Buscando América’ (1984) and ‘Antecendente’ (1988), ‘Caminando’ (1991) and ‘Rosa de los Vientos’ (1996). For this latest project, his first recording in several years after unsuccessfully campaigning for the presidency in his native Panama, Blades has decided to completely rework some of his most endearing compositions, but in an entirely new setting, namely that of Argentine tango. Aided by arranger and musical director, Argentine Carlos Franzetti, Rubén Blades has come up with one of the most intriguing Latin American music releases of the year and one that proves beyond doubt that with careful and skilful application, musical genres can be successfully transposed. This is exemplified on the anthemic ‘Pedro Navaja’, which in the original weaved in Kurt Weill’s music of ‘Mack the Knife’. Here the ambiance is more intimate with strings and bandoneon, and gentler vocals. Originally an uptempo vehicle, ‘Juano Mayo’ is virtually unrecognisable to begin with since it has been transformed into a lilting ballad with guitar and harp and yet gradually the basic skeletal arrangement of the original is recalled. Far easier to identify is ‘Pablo Pueblo’ which is totally reinvigorated here as a languid piece with heightened dramatization, though the main theme is performed delicately. An ideal song to cover is ‘Paul C’ and again the dramatic combination of piano and bandoneon solos works wonders. It has to be stressed that this is not the first time that salsa and tango have met head on. On Eddie Palmieri’s seminal ‘White Album’ (in reference and homage to the Beatles double album recording), the Puerto Rican pianist recorded a devastating Latin-jazz take on ‘El día que me quieras’ that will remain as one of the high points of progressive salsa history. However, Rubén Blades and Carlos Franzetti have succeeded in effortlessly combining two disparate musical genres and for that too we should equally be eternally grateful. Uruguayan singer-songwriter upped both city and country and moved to Madrid in 1995 after being invited by the famous Spanish singer Joaquin Sabina to do so. Five albums resulted between 1996 and 2010, including the last, ‘Amar la Trama’, from 2010 which was reviewed in this column at the time and was an excellent introduction to the singer’s craft. In addition Drexler wrote and sung the music to Walter Salles’ biopic on Che Guevara, ‘The Motorcycle Diaries’, and indeed he won an Oscar for the song ‘Al otro lado del Rio’. For his latest album, Drexler, who for a long time combined singer-songwriting with being a doctor (both his parents are doctors), has come up with a pan-South American sound that takes on board diverse influences and is reflected also in the variety of guest musicians invited for the journey and these range from Chilean rapper Ana Tijoux to Brazilian legend Caetano Veloso and Colombia group Bomba Estereo. Unusual instrumentation and subject matter combined with irresistibly catchy rhythms is Jorge Drexler’s trademark and he excels on the Uruguayan roots number ‘La Luna de Rasqui’ which is a subtle dislocation from the norm and all the better for it. This is precisely the kind of music that David Byrne’s Luaka Bop label would wholeheartedly embrace and indeed one might find parallels between Drexler and say Tom Zé in terms of an idiosyncratic and individualistic approach. The old-school typewriter font of the inner sleeve lyrics and details is testimony to Jorge Drexler’s desire to stay with what he personally feels comfortable with. Tijoux collaborates with the leader to good effect on the bright and breezy ‘Universos Paralelos’ which has something of Latin big band feel to it and lovely 1970s style keyboards. Afro-jazz beats in the use of horns and heavy percussion are a feature of ‘Data Data’ which was co-written by father and son duo Ben and Lee Sidran. A fine collaboration is a duet with Caetano Veloso on ‘Bolivia’, a song devoted to his father. 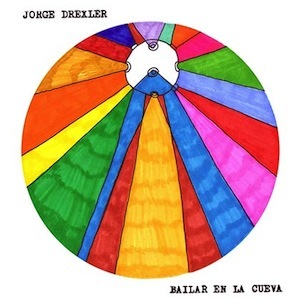 If there is a Latin American singer-songwriter worth checking out, then alongside Caetano Veloso and Ruben Blades, Jorge Drexler is most certainly your man. Drexler is currently three-quarters of the way through a Spanish and Latin American tour with the final concerts taking place in Spain during June/July. The wonderfully quirky graphic illustrations on the inner cover are by Mateo Rivano while the striking main cover is by Rojo Pistacho, a name one is not likely to forget in a hurry. 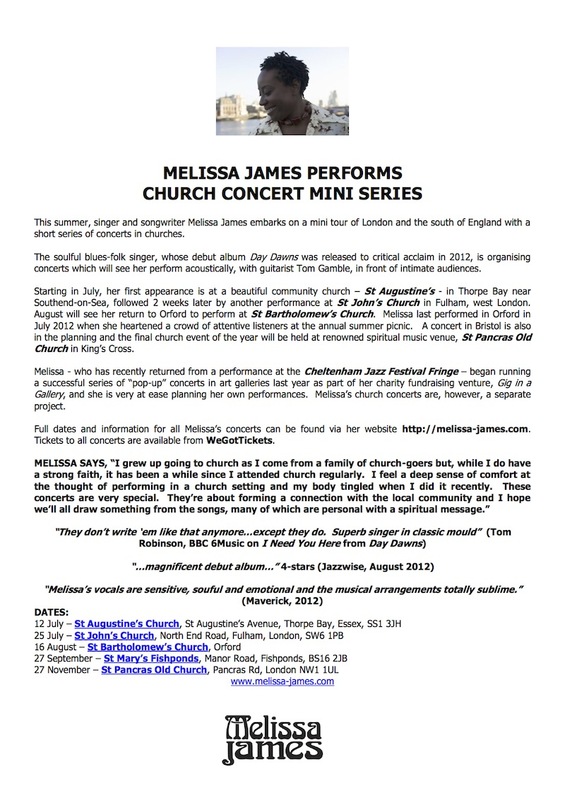 This summer sees bluesy folk’n’soul singer/song-writer, Melissa James embark on fresh and exciting tour of Church concerts localised in the South of England. Starting in St. Augustine’s Church, Thorpe Bay, Essex on 12th July, 2014 and concluding in St Pancras Old Church, London, this is an experience not to be missed. UK Vibe has championed Melissa’s sublime debut album release “Day Dawns” and highly recommends taking time out to absorb first hand Melissa’s wholesome, enticing honey-toned vocals, especially in such an ethereal, acoustic and soothing atmosphere of a church surrounding.